A few weeks ago I found a couple of papers by Daniel Berger, a german researcher who has studied a large group of 13th century stone moulds used to cast pewter objects. Unfortunately they were in German, but I could get an idea of what they said. The photographs too were very useful, and showed stone moulds of extraordinary complexity, much more so than any known so far in Britain. Anyone interested in pewter badges and related objects should read them, or at least copy and paste into google scholar to get an idea of what he is writing about. These are used for shoes. The diameters of the buckles range from 21mm to 24mm, but are all the same design. Which immediately shows that they can’t all have come from the same mould, since you don’t get such variations in size with one mould especially if it is stone as we might expect. From the variations in diameter it looks like we can expect at least 4 or 5 moulds. Now the question is, why the different sizes? Well obviously they weren’t following a pattern book which started “Draw a circle of 22mm diameter”. Instead, wherever the idea came from, someone would carve it out and cast from that mould. But other people might see the buckles and want to copy that design. One way would be to look at it then carve your own. Because of the specific purpose, holding shoes shut, you would expect the copied one not to be too different in size, but even with measuring devices, you could get a mm or two out I am sure. So that’s one way there can be different sizes of buckles. Another would be if you pressed one into cuttlefish or clay moulds. I think that would end up with a slightly smaller finished object, because of the shrinkage of the metal as it cools. Which is not much I suppose, but if repeated a few times could add up to a noticeable amount. Also if you re-carved a worn mould very carefully you could remove only a mm of stone and that way increase the buckle size without technically making a new mould, although I’ve not come across that sort of thing being done. Or finally you just draw a line around one of the buckles, which, depending on how closely you draw and then carve, would likely leave you with a slightly larger buckle. You will notice that I am concentrating on the manufacturing process as a cause. Maybe a customer wanted one a little bigger than normal, but since we’re talking about 2mm and a finished object of around 23mm across, I really don’t think that matters much. I simply can’t think of any social or such reason for the variations in size, whereas I think it can be explained simply enough by the vagaries of copying and reproducing the design. The medieval people weren’t interested in perfect copies at all; they had to look similar, but it’s amazing how many medieval objects you look at and think “That’s not very well made”. Oddly enough, making things properly is rather hard, and so quite a lot of metal objects were not up to modern standards of quality because that’s all they had to work with and even not quite perfect ones were saleable. The worst would go back in the pot to be melted of course, but it’s like with their lack of attention to symmetry in pictures or carvings or some types of decoration – some things just didn’t matter as much to them. So anyway, this also shows the importance of gathering as much information as possible on the individual objects, so that you can mess about with them statistically and come up with hypotheses about the variations. If all buckles found had a 23mm diameter, I would have wondered about the use of only one or a few moulds, or maybe the short lived peak in their popularity that meant only a few were made and used. The final difficulty is that I probably won’t be able to find out how true to history my ideas or observations are. Ah well, that’s the problem with this sort of thing, you can’t get quite the same kind of closure as you can with actual science. That doesn’t mean it isn’t fun though. 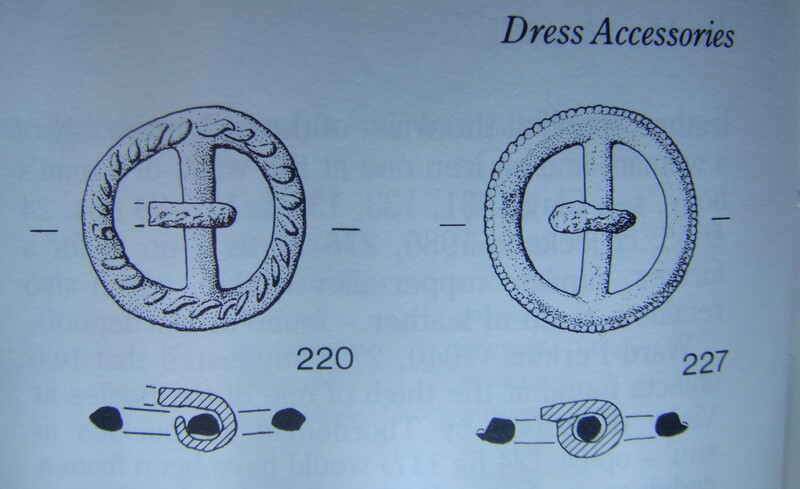 In Tudor times especially (And in the medieval period too), people used cast bronze/ brass buttons. The question is, how were they made? My earlier post Here, suggested that that these bronze/ brass, or rather copper alloy, buttons were actually far more common than pewter ones, yet pewter ones are more commonly used in re-enactments because of their ease of manufacture and cheapness. So the question is, why were traces left on pewter ones, given that pewter is softer and easier to tidy up, whereas the copper ones are very smooth on the outside? The obvious answer is that the buttons are made by lost wax casting or in very very good moulds which don’t leave a line of flashing on the finished product. This is the first button mould I tried to make, I dind’t do a good job so won’t be making buttons with it, but you can see how easily the beeswax has filled it, and the detail it picks up. Whether that detail will be transferred to the finished product is another matter. But there’s a lot of work left for me to do, in carving good soapstone moulds for pewter and making wax moulds. And once I’ve got lots of wax buttons I can put them into the usual kind of clay, melt the wax out, fire it, then pour the bronze in. There’s at least one other way of making buttons with no flashing, by using fine casting powders in boxes, but that is the subject of another post.